Eight Ways to be A Good Customer is getting a good reaction over at my other blog BeConnected. Check it out and let me know what you think. My coworker Sarah Eaton at BeTuitive points to a rant from the latest BeTuitive newsletter that lists the seven words you shouldn't use in email to make sure your message isn't caught by spam filters. You can guess the #1 word and why it's on the list -- Enlarge. Some of the others are obvious but #6 might surprise you. A simple mistake here can defeat your communication efforts. Go ahead and visit the BeTuitive blog for the whole list. If you haven't checked out my professional blog over at BeConnected you have a new reason to click over. I have a new picture of myself up over there. BeConnected is almost a year old now. The central theme is building what I call Customer Intuition. When people meet face to face it's easy to intuit body language, gesture, tone of voice, etc. to determine what they are interested in or passionate about. In these days of electronic intermediation, this kind of intuition isn't always possible. I've filled BeConnected with tools, tips, techniques and stories for developing alternative ways of discovering, monitoring and predicting current and future customer behavior. Sometimes simple tools and techniques can provide a wealth of valuable information about your customers and prospects. If you are a B2B marketer you won't want to miss this blog. If you haven't already be sure and add the feed for BeConnected to your newreader. As always thanks for reading, commenting and linking to both Thinking and BeConnected. Goodyear has an advertising stunt this week that misses an opportunity. 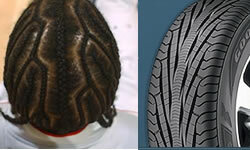 Goodyear selected Detroit Pistons guard Richard Hamilton for a promotion for their Assurance Triple Tread tires. In exchange for an undisclosed amount of cash and a set of the tires Hamilton is sporting a hair style in the pattern of the tires. The move is already picking up press from automotive and major media sources. Hamilton has even sported the "tire-do" with President Bush at the White House team visit this week. The missed opportunity is the lack of online presence tied to this promotion. Even if TV sportscasters go out of their way not to mention Goodyear by name when commenting on the hair do, curious fans and viewers are going to go straight to Google for more pictures and info. If Goodyear was smart they would be ready with a product blog with more pictures quotes and product info ready to be the recipient of all that Google traffic. At the very least they should get going with some Adsense buys. In this world of Internet memes, reality television, and time shifting(TIVO and PVRs) this is the new stunt advertising. But it's no longer about just brand awareness. You can and should anticipate search activity generated by such promotions. You need to use tools like Adsense and blogs to capture that web traffic and channel it to sales and customer relationship building systems. Goodyear drop me an email. Signmaker and extraordinary blogger JD Iles from the great Signs Never Sleep has a very practical nuts and bolts list of the ways he uses his blog to communicate with the customers of his small business. What I tend to do now is at the end of the phonecall, I ask them for their e-mail address. I e-mail them a thank you note for taking time to talk to me on the phone, and send a link to my Blog and encourage them to take a look. Now, my Blog can be the "automatic salesman" and sell to them for the next 10 minutes or 6 months (depending if they take a peek every now and then). Using the Blog this way had gotten me jobs, period! and I have not had to do the "sales work"! Check out the other three reasons why his blog is a good tool here. How is your blog working for you? Jena McGregor tells a holiday shopping tale over at Fast Company Now. Wow it must be hard to deliver a consistent brand experience during the crush of holiday shopping. You'd think retailers would understand this by now. But my moment at Kate's is the perfect example of an incomplete customer experience. A retailer might have the best designed environment, or the friendliest service, but commit the slightest off-brand glitch, and she'll turn on her heels and head for the door. Wonder if any wise managers have time to observe and study customer behavior and reactions during this season. Experience blunders are probably repeated every year. Want to give your employees a gift? Suggest that they read this post from Michael Hyatt's excellent Working Smart blog. Selling your boss is critical to your success. If you can’t get your boss’s approval when you need it, you are not going to go very far in your career. As the president of a company, I spend a good deal of time listening to proposals. Those doing the pitching usually need my approval to proceed with their project. Frankly, I never cease to be amazed at how poorly most people do in this kind of situation. Unfortunately, most of us never receive any formal training in this important skill. As a result, we flounder about, trying to figure out how to do it better. In this article, I want to provide you with a few shortcuts, based on my 27–plus years in business. Hopefully, this will shorten your learning curve. As someone who is constantly pitched one thing or another, I have a lot of experience on the receiving end of proposals. I’ve seen the good, the bad, and the ugly. Here are six keys to getting your boss to say yes. Of course, it would be even better if you took this as a starting point and wrote your own guide to successfully pitching ideas to you or others in your organization. Concise concrete advise like this is extremely valuable to individuals and beneficial to organizations of all kinds because it enhances communication and effectiveness. Well done. I am pleased to be the latest Smart Man Online interview over at Lip-Sticking. If you are interested in finding out a bit more about who I am I recommend checking it out. A big thank you to Yvonne Divita aka Jane for her great questions.